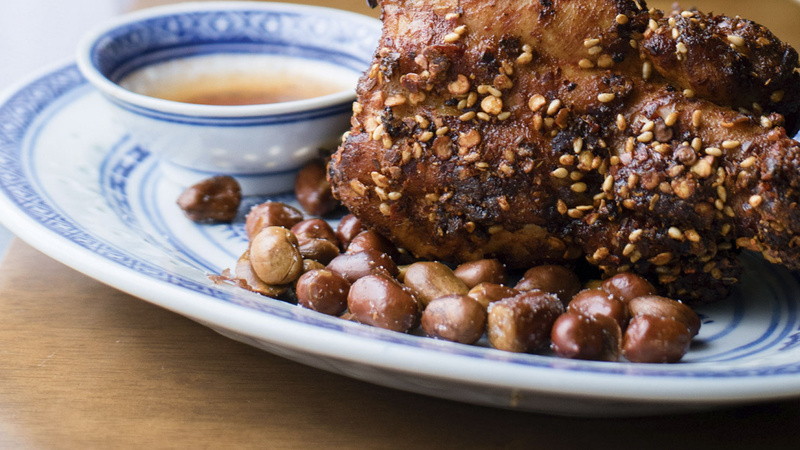 You can either use chicken carcasses left over from other dishes as chefs and co-founders Tongtong Ren and Peiran Gong do at Chinese Laundry, the home-style Chinese restaurant on Upper Street, or pick them up cheaply from your local butcher. This isn't a dish for the faint-hearted – the only way to get to all that flavoursome meat is to roll up your sleeves and dig in. Blend together the ingredients for the marinade and set aside, then do the same for the dip. To make the spice rub, toast the Sichuan peppercorns and the cumin seeds. Mix all the ingredients together. Blanch the carcasses: cover them in cold water in a pot, bring to boil, then leave in medium heat for five minutes. Take out the carcasses, wash the extra fat and impurities off with cold water, and leave to dry – if it’s wet, it’ll be difficult to apply the marinade. Brush the marinade on the outside and the inside of the carcass and set in the fridge for two hours. Heat up a fairly deep pot of oil (enough to cover the carcass) to 180°C and deep-fry for three minutes until the marinated surface of the carcass gets crispy. Gently apply a kitchen towel on the fried carcass to remove extra oil on the surface. Get a tray, pour the Sichuan spices in, and rub them all over the carcass, making sure it’s completely covered. Serve on a board alongside the dip and get stuck in.